Your report is very thought provoking and terrifying. Although I have not found NEAR as many thefts of my photos I think soon have to make a protection of my photos too. Although these watermarks certainly do not make the experience of the pictures better …. I am impressed by your energy in the fight against these people – and in spreading your knowledge and thus helping us. Thank you! I commend you, Truels, for reading all the way through! I hope to never have to write such a long post again! It is a double-edged sword, my friend. I despise the visible watermark on my images but feel I have no choice. Not after what I am going through. The case I posted makes me realize just how un-educated the public is regarding copyrights of images and that if a photo is out there for the taking, you can be sure, it will be taken. I plan on posting a separate page re: image theft and protection. It will contain notes on the dangers out there, what you can do to protect yourself, the various tools to use to locate your images and what to do when you find an image stolen. It will take some time to get that information out there as right now, protecting my current work is top priority. The ignorance out there is simply astounding to me. What strikes me most of all is the irony of ladywildlife’s response to you. I don’t think I’ve ever seen such a poorly composed and spelled piece of business email in my life! I find it difficult to believe that any school or teacher would make use of such a site. Best of luck to you in your quest to protect your images. The ignorance astounds me as well, Karma! Knowing your background, I was wondering what you, in particular, would think of the e-mail. I thought the very same thing, which is why I chose to include a screenshot of the actual email itself (rather than retyping in the text) lest folks thought I was making it up! Some people, I will never understand, and quite possibly it is for the best. I cannot even begin to fathom all of the time you have put into this. Yes, I do think it is best we not understand them! I think you may be giving me more credit than I deserve since I have had many a “less than amazing” moments during all of this. I suppose some could say justifiably so, but I do not like the person I’ve had to become. I am fighting hard not to become bitter and it is with the help of readers like yourself, who have taken the time to comment and provide support, that will keep me away from the ‘dark side’. Ladywildlife’s response begs belief… it’s libellous, hypocritical, inaccurate, and unprofessional on more levels than is reasonable. It’s blatantly clear that she thinks that if it come from Google that it’s instantly her property without restrictions and nothing is further from the truth. “Unsafe for children” and “attack” are strong words, and she should expect to be able to back up her accusations with evidence.that would stand up in a court of law and if she can’t then she is skating on very thin ice indeed..
….but to “give her her dew”, it’s also clear from the massive spelling errors that this lady is far from educated and maybe she just does not have the capacity to understand a rational and polite request. I also thought it interesting that she came back with such a defensive approach (though thieves are known to respond this way when cornered…an intimidation tactic, I believe). She even tried to block me from viewing her site but, please…I’m married to an IT guy and such feeble attempts are almost… amusing. What I have noticed, though, is many animal image pages are no longer available on her site so I am guessing she had other copyrighted and/or unauthorized images posted that she has since quickly removed. If that is indeed true and I had a hand in getting them removed, well then, I take it as a (small) victory. You are probably correct in your assessment of her educational level. 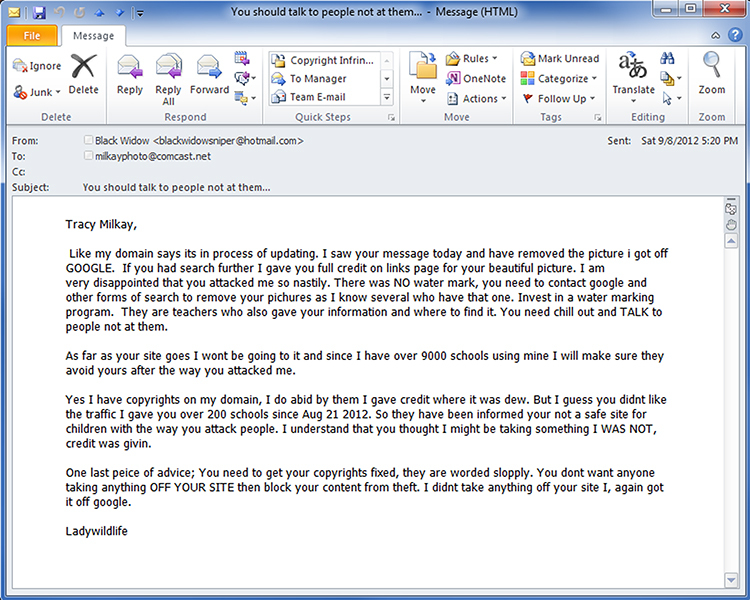 Apparently, she is very good at taking the content of others to create her site as I seriously doubt any of the text posted is of her own (simply based upon her e-mail writing skills as well as the verbiage of her copyright notice). Why anyone would go to her site rather than any of the reputable wildlife sites on the web, I have no idea. All seems a bit crazy doesn’t it… and utterly disgraceful how some people can just take what they want without remorse or credit.. One sad justification for me not feeling the compulsion to post much these days… Glad you’re beginning to get on top of things though Tracy..
We’ve all had our share of unscrupulous souls in our lives. They can choose to do what they’d like but, I know, their due is coming. This whole situation is devastating and disheartening. Seems there will always be some people who want something for nothing these days. I give you so much credit for actually tracking down some of them! Unbelievable! Indeed. It has been a difficult road and is the reason why I’ve been very absent on this blog. My days are now spent watermarking and re-uploading images and sending requests to delete older images from cache. I’m also trying to understand how to best protect my work and doing lots of research to determine optipons. It is all a tiring but neccessary learning experience. Since my work is also out on Redbubble, there is whole ‘nother side to this that I am currently dealing with. I hope by the end of this year, I will have it all straightened out and will be able to pass on my knowledge to others (I plan on creating a separate page just for this topic). Wow. Just… wow. Good on you for not taking this lying down. As for Ladywildlife, her failure to actually understand copyright is equalled only by her appalling manners and email etiquette. But the bit that really gets me is that a photography tutorial site is stealing images… they of all people should know better! I know!! The photography tutorial site shocked me as well….no link back to me or nothin’. What ever became of “honor amongst artists”?? Seriously, though… I’m just happy above all else that you didn’t let all this garbage keep you from getting your creative-on! That would have been about the worst outcome I could have possibly imagined. I see you’ve picked up on the (ahem) subtlety of the images I chose to use in this post. My nature is to sprinkle things with a bit of humor. Otherwise, I’d be the one curled up in a fetal position in the corner and who wants to see that? I agree completely with you that it wastes an enormous amount of time to go around finding and dealing with infringements. In this day and age, we don’t really have realistic option to just stay off the internet. Being online does not in any way negate our copyright protection. It is the idiots who believe what they want to believe, who offer excuses like “I found it on GOOGLE,” etc. None of their excuses are relevant. I have definitely found a copyright notice cuts down on the infringements, which indicates there are still a LOT of people who wrongly believe absence of copyright notice means it’s free. Or, the notice may make them just stop and think, or make the image less attractive as their avatar, etc. Regardless why, it seems to help, so I use it now, even on images for prints. I’ve had a couple people get mad at me for this stuff, too. It’s the old “blame the victim” routine. Good luck with your editing to get all your stuff marked, and to stay caught up with searching and sending DMCA takedowns. Sounds like you’re on the right track. Funny thing is, I thought I’d done all the right things to protect my images (copyright stamps, copyright notices, small-sized images, etc.). But, I’ve been naive. This experience has taught me much and I am determined to get it right this time around. I despise the visible watermark but just today, I’ve created a much better version that I will be applying. Before I do however, I’m getting all my ducks in a row and currently have a question into WP support because I just discovered that my embedded copyright information is somehow being stripped out of the files that I upload. Makes no sense since all I am doing is uploading a file to their site. Must be an issue on their end. I just assumed that information was there and when I went to look for it today, realized, nope, it’s not. I’m glad I found it now instead of after I’d completed all my marking and re-uploading. I’d prefer to go through this process ONCE since I have roughly 850 images to do. How very frustrating to get such a response. I hope the person is more educated then her writing suggests. Obviously, her way of communicating needs to be adjusted. Even when confronted with a strongly worded request, one must handle the situation with care and professionalism. Neither was the case in her correspondence to you. I would like to post a link to this article with one of the photos on Google+. Copyright and watermarks has been a hot topic there and I feel your insight, knowledge and story would benefit other photographers. I have looked into where some of my photos are and have found numerous illegal uses as you have. Time for me to start the work of contacting people as you have done. Good to read that most understand and are willing to do as you ask and the Internet companies are true to their legalize. Yes, indeed, Scott. I’ve become a bit hardened to it. I really don’t care what the thieves of my work think as long as the image is removed and my point is made clear. You have my permission to post a link in Google+ along with an image (you will notice I’ve changed my visible watermark to an embossed style. I like the look of it better…a litle less obtrusive but yet, still there). If my experience can help another artist then that is fantastic. Sorry you have found stolen images. I come across instances every single day. I’ve become quite proficient in tracking people down and writing DMCA notices. Oh, and here’s a tidbit I’ve learned along the way… WordPress does not currently save the EXIF data that contains copyright information with the image! So, for anyone who bothers to add in this info (as I do) or uses programs like Digimarc thinking they are “safe”, alas, once the image is uploaded to WP, that info is GONE. The only way to protect is to add a copyright stamp right onto the image (knowing that people will crop it our regardless if they want to). I’ve had to resort to the visible watermarking here which I am okay with. This site is just for viewing only. thank you soooo much for the education. I’ve been taking my OWN photos. I’m still not quite sure how to get MY INNER CHICK on them! I am so sorry for all of your troubles, Tracy!! I think you are in good company on this issue–Marry Engelbreit just started to add watermarks to all of her artwork, too. On another note–Did you know that the CS Forum was closed abruptly last Thursday? Thank you for your kind words and support. Yes, it has been quite a horrible experience and I find that I have retreated from the internet because of it. Hopefull, in time, things will work themselves out and I will figure out how best to keep my photography on the web without making it vulnerable to theft. Great post with a lot of good information. While I do think some people blatantly steal, I also think there is an issue of ignorance and by raising awareness as you are, it is a step in the right direction. Thank you, Tammy! I agree and I know the industry is trying to find solutions to this wide-spread issue that should help us artists out! We all have to be diligent! I find stolen images every day since even tho I’m watermarking mine, there are still un-watermarked files out there in the image searches. Eventually, they should be eliminated from cache. Until then, my battle continues! I just tried using the src-img page, and I didn’t find any misuse of my stuff – one was a “best of” list that helps attract people to my blog. I did pick some images that get a lot of hits, month after month. I guess my stuff just isn’t commercial enough for people to rip off – or maybe I just haven’t dug around enough yet. Hi Tracy. I hope you find a way to blog, I miss your posts. Hope you are fine, despite all this. I take a little doze of picture searching now and then, because it is indeed a hard job to find a way to communicate, many has turned comments off. Which indicate that they know that they are cheating – In Danish we would say “De har ikke rent mel i posen”. A funny way to say it, : “They don´t have clean flour in the bag”. 🙂 Have a nice day. I am okay. Not as good as I’d hoped. I was finding more and more stolen images day after day and at one point, I’d simply had enough and had to walk away. I am really soured on the whole internet at the moment and giving myself time away to work on real-life things. Im finding it to be therapeutic for me. I hope to post again. Perhaps after our vacation later this month. Your fight against copyright infringement stands as a model for anyone concerned about protecting their work of art. Your experience is heartbreaking, but sadly not surprising. There are just too many people and organisations out there that don’t care as long as they can benefit themselves. The Ladywildlife is surely as bad as they gets. Hopefully it will not keep you from using internet and/or continue blogging. I for one would look forward to seeing posts by you again. Keep the spirit up! Thank you, Munchow, for your very kind words. I am struggling with this as evident by my utter lack of posting. Putting my images on the internet has only served to hurt me and I am wondering why I should bother. Sigh. FOr now, I am throwing myself into the physical world of life and giving the internet a rest. I do hope to return as I continue to photograph! Hi Giiid. Yes, it has been a looonnnnng time. Sigh. I will be posting in a few minutes. I so appreciate your checking up on me. I’ve just not been up to being on the internet but I do so miss everyone! I’ve been enjoying the season…oh where has December gone to? I took photos of this year’s holiday decorations and hope to post those soon.